As we reported last week, the dangerousification of Spring Street is in full swing these days. With the City Council mandated water blasting of the Green Buffered Bike Lane completed, advocates wait for the city to install its completely untested, but less expensive, new paint design. But while we wait for the city to make good its pledge, the Spring Street Green Buffered Bike Lane has actually become one of the more dangerous places in the city to bicycle. Anecdotally, cyclists have complained that the lane is rough, gravelly in places, because of the water blasting. A city employee, who asked not to be named for fear of retribution, recounted via email that a driver cut him off. When he complained was told by the person behind the wheel that the city removed the bike lane. 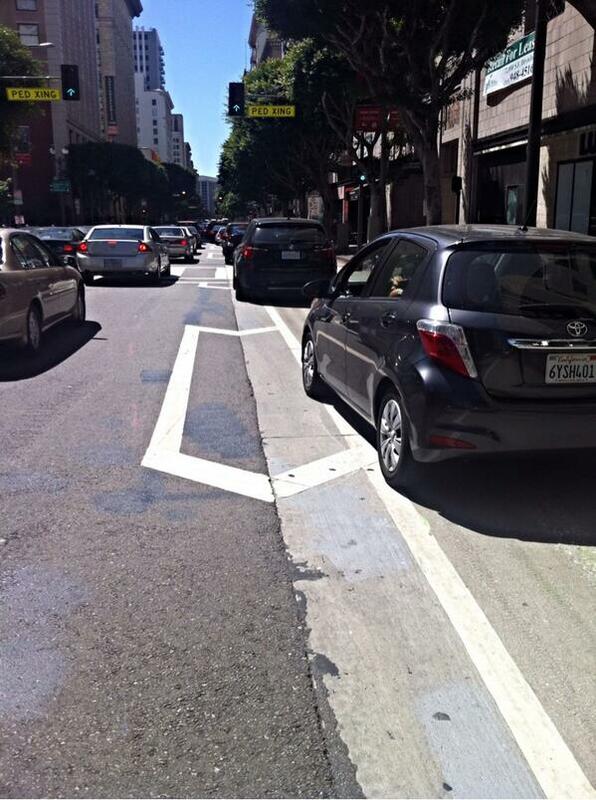 And of course, the Green Buffered Bike Lane is now being used as a parking lane as shown in the pictures to the right. After all, if the city doesn’t respect the lane, despite its safety and economic benefits, why should anyone else? If anyone wants to thank city leadership for their role in helping L.A. become the first city in the country to un-paint a green bike lane, or maybe encourage them to get serious about putting down the unproven design they approved, contact the Film and Television Industry’s City Council Member and Mayor at tom.labonge@lacity.org and mayor.garcetti@lacity.org. On top of all that, the removal was performed by an extremely noisy machine over the course of many late night hours on multiple nights. There were pretty extreme levels of noise for most of the night along one of the densest (if not the densest) residential corridors in the entire city; all to make the streets less safe. This kind of high impact street work would never be done late at night in any low-density residential neighborhood. On the other hand, in downtown the idea of closing a single lane of traffic on a single street during the day is so unimaginable that it’s apparently acceptable to keep thousands of residents awake at night for this non-urgent, largely unnecessary and potentially harmful “repair”. As this image shows, a major issue with the current and proposed bike lane design is the concrete surface: it is very difficult to see white lines on light grey concrete because there is very little contrast. The green paint was somewhat effective in counteracting this issue; now, the bike lane is barely visible. I don’t think a thin green line is going to make much of a difference on this surface. I’m slightly optimistic, since it’s a darker green (better contrast with the concrete and the white line) and is about the same width of the normal white line. Additionally, the conflict zones will apparently have the full width dark green treatment. Damien, thank you so much for posting contact information and making it easier for readers who want to take action to do so. This is Garcetti’s first bike-friendly act as mayor. He is dead to me now. Flamethrower is coming out of the barn and the mayor is not getting a pass. We’ve needed to be mobilized and organized from the get-go and it is precisely for things like this. Putting unprotected bike lanes in a downtown area of a large city will tend to get motorists to use it for parking or a moving lane. Those problems are why New York City started installing barrier protected bike lanes. I stood for several peak weekday evening hours observing the traffic flow on Spring St at about 5th st after the green bike lanes went in. The photo on the right looks just like what happened when the vehicles would occasionally back up at a red light. Some drivers would use the bike lane as a passing lane to move past the vehicles in front of them. Garcetti has always struck me as two-faced, more so than most politicians. He’s really good at getting people to think he’s enlightened and on their side because of his adept use of social media and other means of communication. People let their guard down and feel good about him, then aren’t prepared when something like this happens. I’ve already been yelled at “for being in the middle of the street” while riding in the spring street lane. There also seems to be more cars driving in the bike lane and despite this, many still prefer to make right hand turns from the lane to the left of the bike lane. Drive in the bike lane but not when turning right?